Every time I make this candy it is a hit. It’s the perfect combination of sweet and salty. I found the recipe on Cookie Madness, an excellent blog that you should enter at your own risk (try not to drool on your keyboard when you visit that site!). Break the pretzels and fritos up with your hands. Place them in a 9×13 pan that is lined with parchment paper or no-stick foil. 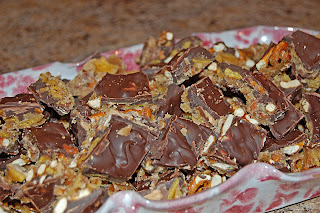 Coarsely chop up the peanut butter cups and scatter them in the pan as well. Melt the butter over medium heat, then stir in the brown sugar. Bring it to a full boil and boil 1 minute, stirring once or twice. 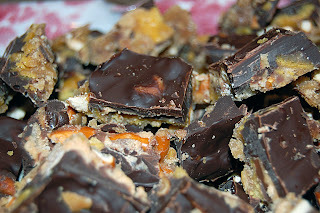 Pour this mixture over the pretzel/frito/peanut butter cups. Bake for 8 minutes at 350 degrees. Take the pan out of the oven and sprinkle with chocolate chips. Pop it back in the oven for a minute to melt the chips. Spread the chocolate over the top. Cool and then refridgerate for a while. Take it out of the pan and break it up, using a knife to cut it into rough pieces. Make this. It’s yummy. I was one of the moms who raved about it when Tiffany sent it to a party her son attended. So good! I love a salty/sweet combination. 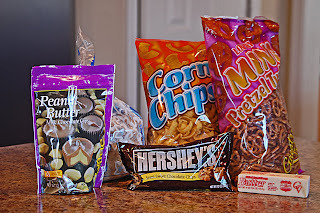 I think that’s why I’m so crazy about that chocolate/peanut butter chex mix. This looks soooo good. I must stop looking. oh dear Lord..I’ve died and gone to heaven..its a combination of all my favorite things!!!! (BTW, I’m going to try the haiku prompt later and will comment on that post with a link to mine). There are at least 2 weeks out of each month that could be MUCH easier with this stuff around. Thanks for my comment. This looks yummy….I think I will try it!! I’ve never heard of Frito candy, but it looks awesome! I’ve heard of this before but never tried it. It looks delicious! Hi! I saw you on SITS. I love salty candy! I’m going to have to try this one! Homeschooler, huh? My daughter is not yet 2 and I am considering that in the future. 😉 “Tree” will be there when you are done with the quick fic-fix–it is a wonderful story, though…hope to hear from you again! You aren’t playing fair!! I am such a sucker for sweets! I make something similar, but this looks so much better. Mine only has saltines on the bottom, covered by the sugar/butter mixture, cooked and then covered with the chocolate chips. Oh, holy cow! That looks amazing! This look so good. I can’t wait to try it!! This is such a neat combination! I love to sprinkle salt on top of anything chocolatey I make, so I know this would work :). We just made this, OMG it is FABULOUS. M1 and I started eating it before it was even cooled. This stuff is GREAT! My daughter is coming home from college in a couple of weeks for Spring Break & she wants to cook while she's home. I'm putting this on the top of the list of things to make, it sounds DE-vine! I’m trying these- I’ve never heard of them! Interesting. Gonna have to try these for sure. Sweet and Salty together is always a good mix. So glad this was highlighted in the weekly menu post…I am saving this for the holidays! I am a sucker for sweet & salty!